Colourful stories no. 10 – Happy centenary! 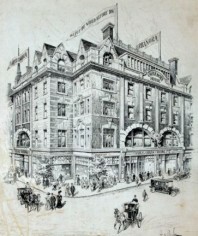 On 1 May 1908 a special demonstration was held for the press at 89-91 Wardour Street, London. The occasion was the opening of Urbanora House, a prestigious new home for the Charles Urban Trading Company, the leading British film company. Previously based at nearby Rupert Street, the CUTC had relocated to much larger premises, and in doing was to have an important effect on the future of the British film industry, as it was the first film company to move to Wardour Street, soon to become the unofficial home of the native film industry (a symbolic role that it arguably retains to this day). Urbanora House was designed to dazzle. For anyone who believed that the British film business was a minor industry of ramshackle appearance and sometimes seedy reputation, the new building was a bold statement of better intent. The 250 attendees, representatives of daily newspapers, the photographic and cinematograph trade press, and the film industry, were led through stylish, well-appointed room after room. The Kinematograph and Lantern Weekly was particularly struck by its implications for the industry. Urbanora House makes an impression on the member of the trade first of all because of its spaciousness but even more noticeable is the manner in which that space has been used. The many thousand feet of floor space are divided up among the bewildering number of departments so that hardly an inch is wasted. The building is at once factory and office. On the ground floor are the distributing offices, secretary’s office, advertising and correspondence departments and the projection hall. The latter calls for special notice. It is easily the largest in the English trade, accommodating over one hundred if necessary, and is beautifully fitted up. The size of the hall allows of a picture of a size equal to that of most public exhibitions being shown. The projection hall, like the entrance hall and staircase is beautified by a series of pictures, many reproducing scenes with which Urban films have already familiarised the trade. The floors above continued the wonders of Urbanora House (left): the drying room with drums capable of drying 12,000 feet of film per hour, the rooms for film processing and equipment manufacture, a studio on the top floor, with Ladies and Gentlemen’s dressing rooms adjacent, and rooms for experimental work and colour cinematography. The latter was the day’s triumphal flourish. All were ushered into the projection hall, where there was to be an exhibition of ‘Animated Photographs in natural colours’. This was the first public exhibition of the two-colour motion picture process which had been patented by G.A. Smith in 1906 and whose development had been funded by Charles Urban, whose mansion Urbanora House was. 1 May 1908 was therefore the first time that the public saw motion pictures in natural colour. Another motive which prompts me publicly to exhibit my early results is the desire to bring to a crisis a sort of intellectual scandal. I have been actively engaged with Mr. Urban in the art of the Bioscope for the past twelve years, and during the greater part of that time have heard of people and have met people who claimed to be able to take pictures in natural colours. The Patent Office is presumably littered with the specifications of inventors who are free with their theories and loud in their claims. But we never see their performances! We frequently meet with gentlemen who tell us of their patented ideas, but never have they yet come to the practical point of showing us the thing on the sheet. So well is this state of things recognised and smiled at that I am beginning to be nervous of being placed in the same class and am therefore willing to take you into my confidence and exhibit my experimental results in the hope that other claimants will be sportsmanlike enough to follow my example if they are able. … we must observe that, as present produced, there are fringes of complementary colours, red and green, outlining swiftly moving portions of the composition. Thus, so long as the movement is of a moderate speed or the object is a considerable distance from the camera, this defect is not apparent, but when the object is in rapid motion and is located a very short distance from the lens, two sucessive images are sufficiently dissimilar to make absolute registration of the complementary images impossible, hence the coloured outlines. That’s a good explanation of the inherent limitation of Kinemacolor, that the successive red and green records inevitably could not capture precisely the same image if the subject was in motion, and one which the system was never to overcome. And so motion picture colour was launched upon the world. It’s not a centenary that’s likely to be picked up on by the broadsheets, or frankly even the motion picture press, alas. So let’s raise a glass here, and if you’re in London some time, take a look at the bottom of Wardour Street, where Urbanora House still stands, indeed with a grand stone fascia on top still bearing the name ‘Urbanora House’. That’s where it all began. Luke: Happy 100 years to Kinemacolor. The test films were a good demonstration of the process. I wonder if the studio on the top floor had enough natural light to shoot, or if it also used artificial light. It is good to read that Urbanora House still stands. I don’t know much more about the studio, but I assume it used artificial light only, and that therefore it was not used for Kinemacolor, which was hopeless under such conditions (the additive system absorbed too much of available light). Kinemacolor dramas were shot in Hove or Nice for the most part, in open-air studios.